A few years back, I bought and read an excellent biography of Bill Mantlo. While reading it, I realized that many of the earliest comics stories that stood out for me were written by him. (This was back when I was too young to be concerned about creators.) And I thought that, since his work did resonate with me, maybe I should pick up Rom and Micronauts as he worked on both of those titles, which I'd always heard good things about. But when I thought about it, I came to the conclusion that they weren't anything I could simply wait for a trade collection of, since the rights to the characters are not owned by Marvel, the company who first published the books. That's not to say they'll never be reprinted, of course, just that there's a larger legal challenge there than if Marvel wants to collect any of the characters they actually own. But, due to a variety of circumstances, I haven't been terribly active in looking for these back issues. I think I've scanned eBay only a handful of times, and I was immediately dismissive of anything that wasn't a complete run. And, even then, I've really only given consideration to a collection if my out-of-pocket exspenses amount to maybe a dollar a book. From what I'm seeing, that's not only not unreasonable, but it's only just shy of what some of these collections go for. 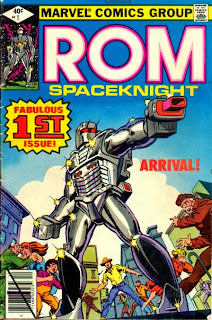 Rom tends to run a little pricier than Micronauts but overall they even out. Here's the thing, though: I'm interested in these for the stories. I don't really care that they're the original comics that were on newsstands back in the day. I don't want the artifacts for their own sake; I want to partake of the content. Retailers, of course, have seen this trend for some time. That's why so many comic shops have switched from rows of long boxes to bookshelves of trade paperbacks. But while there are some interesting things going on here econimcally, there's also something interesting that's happened from a fandom perspective. Namely, comics fandom split in two. To be fair, there wer any number of splits in comics fandom before then. You had Marvel versus DC, Superman versus Batman, American comics versus European versus manga, newspaper strips versus pamphlets, etc. But this was another significant rift, and one that would be difficult to bridge. Back in the day, if you wanted to read the first appearance of, say, Wolverine, you had to track down original copies of Incredible Hulk #180-181. That story simply hadn't been reprinted. Which means that if you were an early Wolverine fan, you were scouring back issue bins looking for a first (i.e. only) printing of those two issues. A decade or two later, and it would be reprinted half a dozen times in various formats, and a year after that, it would become available digitally. But in the mid-1970s, a person just looking to read that first story had to do the exact same thing a person who had to have a complete run of Incredible Hulk did: they had to scour back issue bins. The Wolverine fan and the Incredible Hulk completist look the same. But now? Why should a Wolverine fan ever bother looking for that issue? It's been reprinted almost two dozen times, and is available in multiple electronic formats, all of which are far cheaper than the original issue. The Holy Grail for him/her isn't having the issue, but reading the story. But that collector looking to have a complete run? S/he is still hitting the back issue bins, leaving the Wolverine fan to wonder what the hell his/her problem is. Which is unfortunate because that split between the two groups creates a mental barrier that separates us further than is necessary. Part of the joy of fandom is connecting with other people, and if we're seeing a split within fandom... well, that's not very connecting, is it? Of course, appearances by non-licensed characters with licensed characters are also "lost" stories since they can't be reprinted. Marvel 2-in-1 #21 (Doc Savage and the Thing), Giant-Size Spider-Man #3 (Spidey and Doc Savage), Batman #253 & #259 (The Batman and The Shadow), and the entire run of ROM will never be found in new editions. Considering both Marvel 2-in-1 #21 (BlackSun) and Rom (Dire Wraiths, Galador, SpaceKnights) introduced characters that have become part of the Marvel Universe, it's sad that many fans will never see their introductions unless they can find the original comics.